Your infant, or young toddler, is gaining new skills every day, and many parents can become confused about what is typical in terms of communication and speech acquisition. Typically, children develop according to a general timeline, so if you notice your child is not meeting certain milestones, you may want to bring them up to your pediatrician. 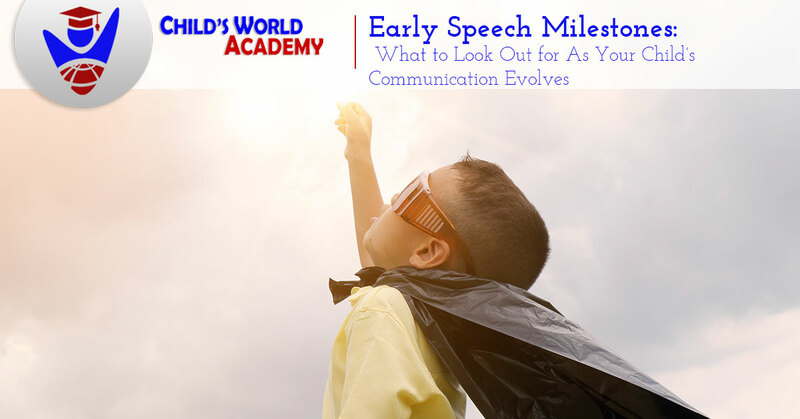 Not every concern is a sign of an impending speech delay, but taking these issues through with a professional will let you know when to become concerned, and when to simply be patient and let development run its course. Child’s World Academy is Monroe’s Top Rated® Local child care center and our curriculum is designed to help your child learn through the exploration of the world around them — from infancy to preschool. Here are a few things to look out for that can affect your child’s evolving communication. Does your infant respond to your voice, to music, the sound of games and electronic toys? If he does not, it could be the sign of a hearing problem or another developmental issue that could disrupt speech acquisition. If your infant has not begun to babble by the time he is 6 or 7 months old, talk to your pediatrician. Most children will start vocalizing with vowel sounds and eventually will put together a basic consonant and vowel combination, like “dadadada”. If your child isn’t doing this, he could just be working toward it, or there might be another issue at hand. Your baby’s responsiveness to you is also an early indicator. Does he turn his head when you speak his name? Does he imitate sounds you make? By nine months, if you’re not seeing signs of this, talk to your pediatrician. By the time your child reaches his first birthday, he may be saying a few basic words like “dada”, “mama”, and the popular “uh-oh”. Encourage these early words by repeating them back to him when he does say them. Review the words he is using with his pediatrician at his one-year check-up. Non-verbal communication is key. By the time he is a year old, your little one may be waving hello or goodbye, or shaking his head “no”. Take note of the ways your child communicates with you in a non-verbal fashion. As your child reaches 18 months, he should be able to understand a bit more language than he did before. Can he follow a simple request, such as “come over here” or “pick up the doll”? Ask his teachers at daycare what they think about his receptive language. Between 18 and 24 months, language may begin to explode. By the time he is two-years-old, he will likely have close to 50 words in his vocabulary and he may be putting two-word phrases together, especially if he is absorbing language from other children at his childcare center. Review his progress at his two-year check-up. At two years, can your child communicate his most immediate needs to you? Is he asking for more milk or for his favorite blanket? Not all children will display all of these new speech behaviors exactly according to typical timelines, and this does not necessarily mean that your little one has a speech delay. But it is smart to keep an ear out for speech development and to ask your doctor whenever you have a concern.